What is the best all around set up for mowing????? Discussion in 'Lawn Mowing' started by THORNTON SERVICES LLC, Jan 31, 2013. I was curious to see what everyone else has decided was the best set up for mowing lawns , kinda seems like eather the set up is to big or to small , trying to be as efficient as posible , want to be able to do large accounts and small all on the same route with the most compact and efficent set up , right now we have things set up for 2 set ups , one is a small set up and the other a large trailer set up , would like to just mow all out of one set up. Thanks for your input , photos are also apreciated. productivity is always going to be a huge debate in this industry. Which set up is best for you is normally based on a per day route. IF you have small and large properties on the same day, then bring a large and small mower. My ideal productivity uses two different trailer set ups with the same trailer. If you are loading and unloading your trailer every day, it wont be too much effort to change the set ups each day of work. I schedul small properties mon-tuesday, and large properties thurs and friday. 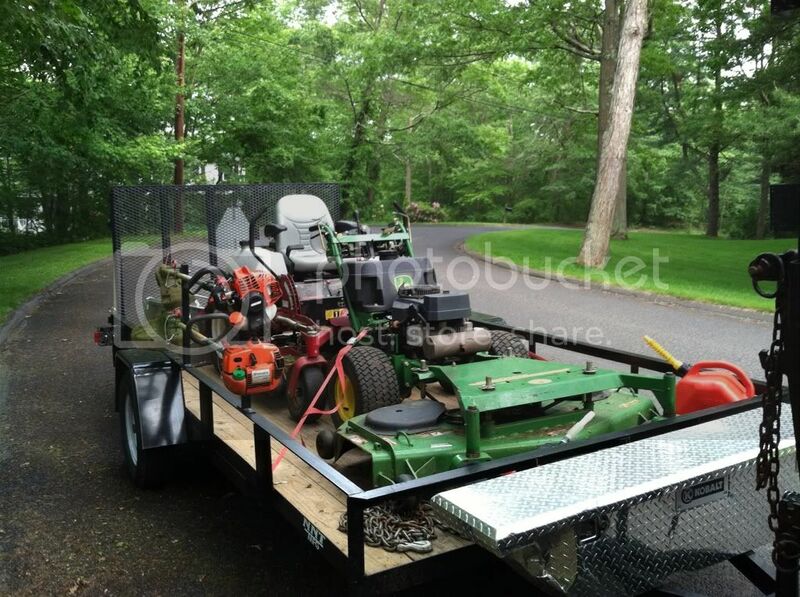 Wednesday is when the trailer is packed with all the mowers to get the large properties with small back yards and the yards the medium sized and in between properties that need more than one mower. This gives us best productivity without lugging around all five mowers all the time. The only way i would do it differently is if i was using an npr with an 18 foot bed plus a dovetail so i could carry everything without a trailer. I wouldnt trust my guys with a huge trailer in the small areas we work. Our rig is almost 38 feet long as it is with a 16 foot trailer. I'm thinking if I was running a two man crew, I'd send them out with 2 48" Walkers and 2 21" Toros on a 16' trailer. Maybe on Mondays replace 1 of the Walkers with a 52" midmount zero turn to do low end stuff and side discharge mowing. Each truck has different trailer setups but about the same mower setups. I run a 32ft gooseneck with chevy truck so were long. It has a dump box on it. Usually this rig is strictly large commercial as they dont move alot once on site. Usually 3 exmark 52's. usually two exmark WB's. Then trimmers, blowers, gas. Sometime we run with 72 front runner exmark too. Other trucks all have a 24 ft trailer and usually one exmark 52 and one exmark WB. Then the usual small hand helds. Around Morgantown I think that a stander or small zeros are the way to go, I run a 52 zero and a 48 zero as well as a 52 walk behind. 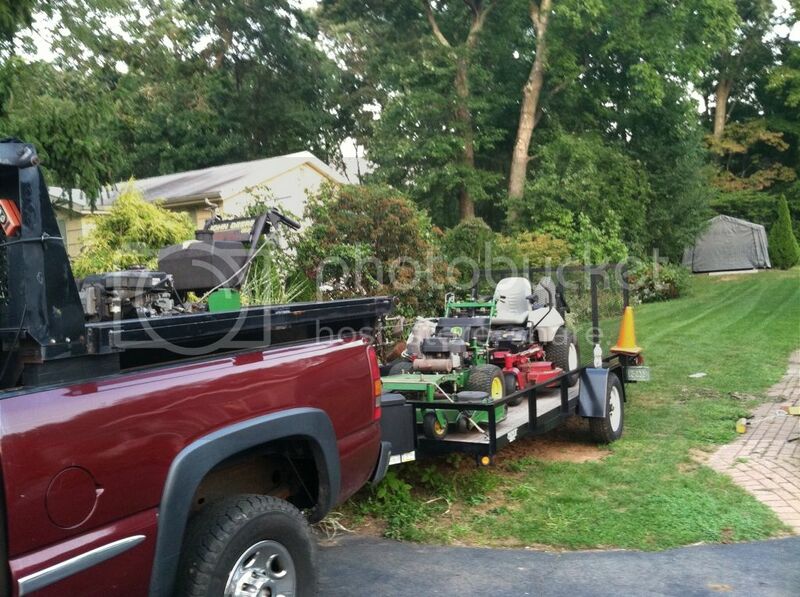 I can cut a normal lawn in Greystone and then go to one of my larger estates around 7 acres with the same trailer. We can cover alot of ground with the two zeros going and I think that anything bigger than 52 could really scalp around here. the one set up i run in the box trailer i run a 52 walk behind and a 60 zero turn most of the time , but i have another set up that i use a 10 ft open trailer for those hard to reach areas , just take the push mowers and the 52 walk behind on it usually. I was just curious what every one else was doing , i have no experience with standers , lh jones in sabraton has the new gravely stander in , as far as wright , pass can order them but i just cannot bring myself to buy something i can't use and test first. Do you use standers if so how to they handle the hills? Thats what i would use it for , most hours go on the zero turn though. i know i have been looking on the net at the super lawn care trucks they look awesome , i still have to pay off my last plow truck , i do not like to finance stuff and yea i figure the trucks are pritty expensive , i wonder how the ramps on those trucks handle wet tires etc , the truck ramps seem a little steeper than whats on a trailer and i know when its wet sometimes i have to get a little run and go just to get up on the trailer , especially if it is parked on an incline already. Yea that seems like a good set up though.